I love a good deal. I think it's in my genes. I also love delicious, fresh, unengineered produce. So when I was in Boston a few weeks ago and my friend told me about homegrown heirloom tomatoes for sale at a local home for only $0.15 apiece, I wanted to see it myself. On a card table in front of a home in Acton, MA, a family of generous gardeners leaves their daily crop of gorgeous tomatoes, cucumbers, and other summer veggies for the locals to purchase—on the honor system. They just leave a little money box out there, open and unlocked, for us to pay them. 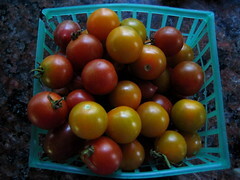 At only $0.15 per tomato or basket of the tiny, sweet fruits, they don't net a huge sum of money. But the concept of trusting people to pay what they owe is a delightful throwback that I truly appreciate. It's the end of the season, so they didn't have as many tomatoes as they had during peak season, but for just pennies a pop, the selection was great. We picked out two colorful baskets of cherry tomatoes and four fragrant, imperfectly perfect large tomatoes. 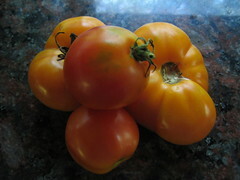 Compared to the tomatoes they have in the grocery store, well, there is no comparison. My friend Judy would say that they taste like candy, and she'd be right. They burst on the tongue, sun-warmed and sweet, the perfect addition to any meal. And they smelled like summer. Sunny, sweaty, warm, wonderful summer. Two nights ago, LA was surprised by a rainstorm. It just happened out of the blue, summer waved goodbye and autumn rocked us to sleep. It felt good to hear the rain outside as I curled up in bed. Given everything that the hurricanes have put the South through lately, I felt guilty enjoying the sound of rain. But if there's one thing I've learned in my life, it's that even if you feel other people's pain, you can't really do anything to take it away. So tonight, I donated a plane ticket on Southwest to the victims of hurricane Katrina. Maybe I can't eliminate their pain, but I can at least try to help them get home. Hmmm, how to connect tomatoes with hurricane Katrina? I know. I'll spend another $1.20 on tomatoes so I can throw them at George Bush until he does something to help or speaks coherent English. Whichever comes first.